On the morning of May 12, 2016, three out of a stack of six containers belonging to a maritime organization, Sifax Group Ltd, fell on some makeshift homes sheltering persons forcefully evicted from Badia-East community in Lagos in September, 2015. The fallen containers injured many, and caused the untimely death of a lady named Ms. Ngozika Nwankwo, reportedly aged, 35 years. Spaces for Change’s (S4C’s) Godwin Ogla and a community leader of Badia-East, Mrs. Biola Ogunyemi were on ground to document the incident, calm distressed residents and facilitate rescue services. 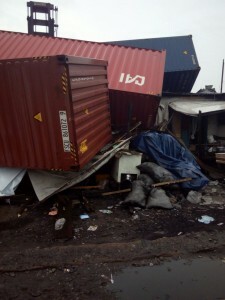 This accident, and needless death, could have been avoided if the September 2015 demolition of Badia-East did not happen, or the Lagos State authorities took adequate steps to ensure that the displaced persons in Badia were properly rehoused or compensated for the losses of their shelter and livelihoods. Bulldozers operated by agents and officials of the Lagos State government carried out the evictions at the instance of the Ojora Chieftaincy Family. The demolition exercise was not preceded by any prior meaningful engagement with residents nor were notices given to the community members, leaving these hapless citizens at the mercy of inclement weather, and at the receiving end of falling tanker incidents. Many of the distraught evictees including men, women and children of all ages, barely survive, living out of makeshift structures – not even worthy of the tag shanty – erected some meters away from the railway line. Daily, they struggle to eke out a living despite the harsh environmental, psychological, and physical health hazards they live with. With the latest incident, they now feel unsafer than ever before. Eye witnesses narrate that the container fall resulted from the negligent stacking of the containers by employees of the Sifax Co. on May 11, 2016, possibly without due consideration to the weight and gravity factors when stacking heavy objects. There was an initial challenge getting the corpse to the morgue, leaving the body of the deceased outside for about eight hours. This was as a result of the Police officers’ vehement refusal to use their operational vehicles for the evacuation, citing official directives. Succor eventually came when officials of the Lagos State Emergency Management Agency (LASEMA) came in to evacuate the corpse to the mortuary. LASEMA and a detachment of the Nigerian Police Force from the Railway Division at Ijora Badia provided rescue services and relief to some of the victims. In an interview with Mr. Omoleye, the Divisional Crime Officer (DCO) and Mr. Uchenna, the Divisional Police Officer (DPO) of the Division, we confirmed that one of the executives of the Sifax Co. was detained briefly and later released. Contact data of the Police officials were collected for a follow-up meeting sequel to completion of the Police report to be prepared on the incident which would serve as one means to galvanise positive government action on providing restitution to victims. Attempts made to speak with the management of the Sifax Co. failed. In a press statement, including correspondence with the Lagos State Government regarding the incident, SPACES FOR CHANGE demanded that persons rendered homeless and vulnerable since September 2015 be given immediate humanitarian assistance, including adequate temporary shelter while long-term solutions are processed within clear timelines communicated to all stakeholders in line with the Lagos Government’s stated objective to promote development through peace.